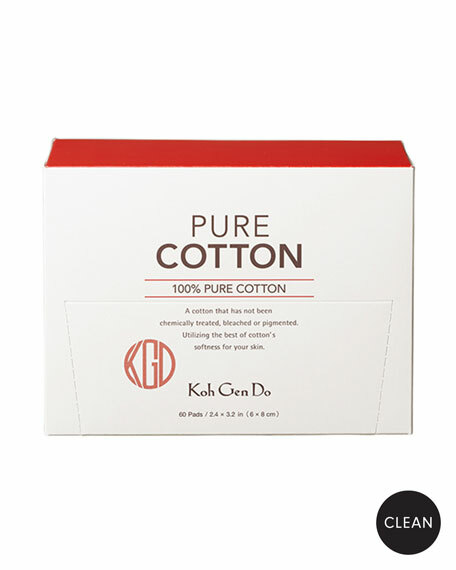 Woven from 100% pure cotton that hasn't been chemically treated, bleached or dyed, our extra-thick cotton pads provide the delicate care that sensitive skin requires. Made from cotton grown without chemical fertilizers and pesticides, these durable squares are extra soft. Use them to apply face moisturizer and makeup, wipe off cleansers, or saturate skin with our Oriental Plants Lotion as a cotton face mask. *Certified organic in Japan. Use to apply lotion or wipe off cleansing cream. To use as a mask, saturate cotton with our Oriental Plants Lotion and tear into several layers. Place layers across the face so that they slightly overlap and cover all areas of the complexion. Leave on for 5-10 minutes, then remove. Do not rinse. 100% pure cotton with superior softness and durability. Hasn't been chemically treated, bleached, or dyed. Gentle on delicate and sensitive skin. Made from cotton grown without chemical fertilizers & pesticides. Inspired by her own needs and the deeply rooted skincare traditions of Japan, Ai Saotome began work on a line of pure and healthy skincare designed to help give skin radiance both on and off screen. She then extended these skincare benefits into a color cosmetics line including its iconic, red-tubed Moisture Foundation.